Raw manuka honey is extracted from the flower of the tea tree bush (leptospermum scoparium), whereas manuka oil is extracted from the tiny leaves of the manuka bush, by distillation. When you buy Manuka Oil, you need to look at the concentration in a 1oz container. 100% Pure Manuka Oil is much to potent, when applied to any external surface skin condition. This is why our company only offers the correct solution, which means, our manuka bottle contains a ratio of 10% Manuka Oil, in a 90% almond oil base. 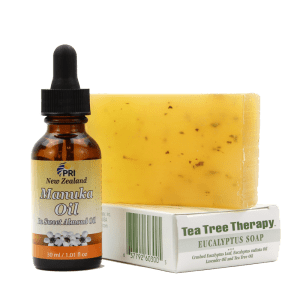 Diluting the pure manuka oil by a factor of 1:10, has shown to be the most beneficial, soothing and coating, when applied to surface skin blemishes for humans and animals, dealing with common skin infections of many kinds. 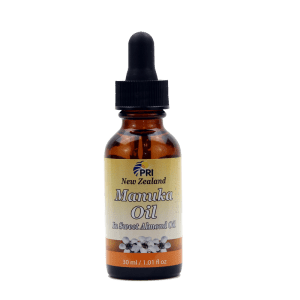 Manuka oil is imported from New Zealand, and filled with the carrier almond oil, into eye drop type glass containers, so you can simply buy Manuka Oil at its perfect concentration and purity. When visiting New Zealand a couple of year ago, we took the time to stop by one of the Manuka Oil distilleries in New Zealand. We hired a small Cessna plane (and pilot) from Auckland New Zealand, to fly to the Great Barrier Islands, where we met up with Sven. Sven demonstrated to us live, how he extracts Manuka Oil from the leaves of the tea tree bush. His set up looks just like a liquor distillery, but is operated to extract Manuka Oil. It takes 1 TON of the tiny manuka bush leaves, to extract just 1 LITER of Manuka Oil. 1 Liter of Manuka Oil, is almost the price of gold, that’s how precious it is. Manuka Oil in its 100% purest form, is known to be about 30x more potent than the common tea tree oil harvested in Australia, according to a study published by a neutral, third party, nonprofit entity. As always, when you buy manuka oil, know your authentic source that you can trust and share with others.